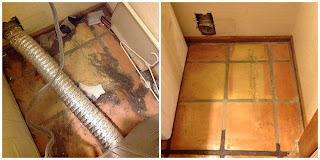 the Joe Filter blog: Dryer Vent vs Lint Trap: Whats the Difference? Dryer Vent vs Lint Trap: Whats the Difference? Dryer vent, lint trap, same thing right? WRONG! Many of us use our clothes dryer very frequently throughout the week but not all of us know about the importance of cleaning the dryer vent. 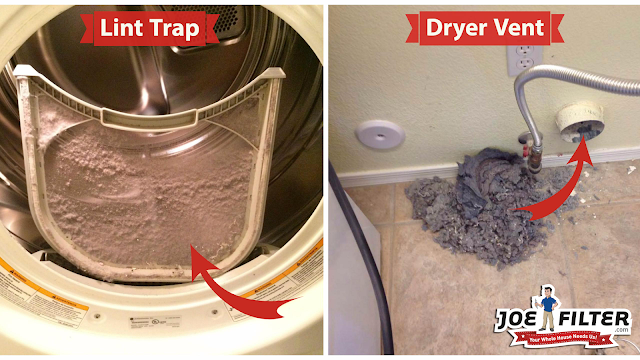 This is typically because many confuse the lint trap with the dryer vent. Though both the lint trap and the dryer vent are equally important to clean, they could not be more different. The lint trap should be looked at as the dryers first line of defense against lint build up. It is usually clearly marked and easily accessible. Typically it's located right inside the dryer's door or on top of the dryer. The lint trap is used to catch the majority of the lint from your laundry before it gets into your dryer vent. The lint trap should be cleaned out after each dryer use. See the GIF to the right for how to clean your lint trap. Your dryer vent on the other hand is located behind your dryer and is connected to the vent via a flexible silver duct. The dryer vent is the exhaust vent/ducting system that exhausts the heat from your dryer to the outside of your home. During the dryer cycle lint from your laundry can sneak past the lint catcher and begin to build up in your dryer vent, even if you are good about cleaning off your lint catcher every time. In about the span of a year (sometimes less) the lint build up can create a blockage in your vent. A dryer Vent blockage can lead longer drying times, wasted energy, and even fires! This is why the fire department recommends cleaning your dryer vent at least once a year. If you are unsure how to clean it or do not have the correct tools, we recommend consulting a professional dryer vent cleaner. To learn about our other in home services or our Healthy Home in a Box please visit JoeFilter.com.